Some things age more gracefully than others. This was first posted 8 years ago, so caveat lector. Links may be broken, things may be wrong (this is the internet, after all), and you may be better off finding more recent and relevant content. Blogs are rarely graceful on a good day, let alone after a few years. Just a heads up out there: Sartorial Stitchery has moved to its own domain. For those of you who don’t follow my stitchery adventures, nothing has changed in your world. 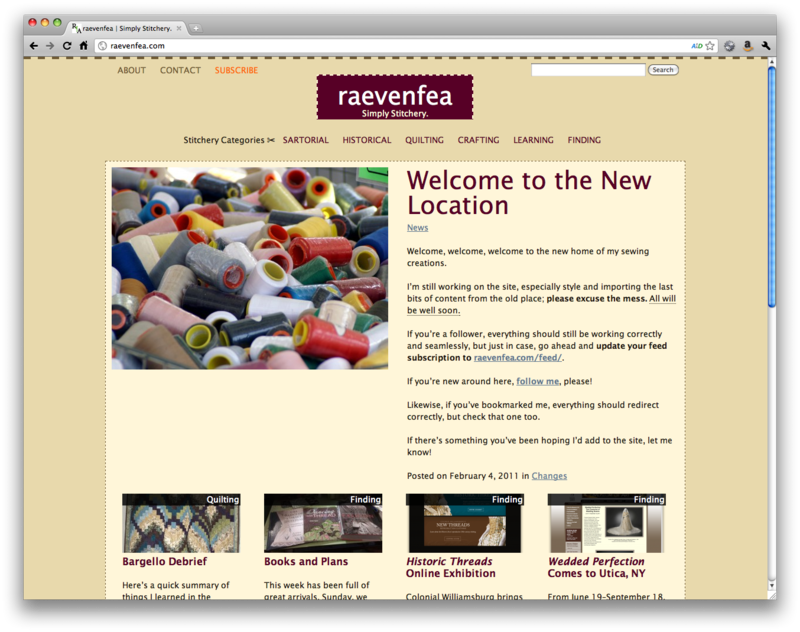 For those of you who subscribe to the Omnibus RSS feed and do like reading about my sewing stuff, unfortunately you’re going to have to add another feed to your reader for the time being: raevenfea.com/feed/. I hope to somehow integrate the two back together in the future, but no ETA on that any time soon. Sartorial Stitchery was not only misnamed, but had outgrown this shared space, so it was time to give it its own home (I already owned the domain, with nothing on it). The design is still rough, and a few more articles need to be moved over, but it’ll be growing over the next few months!